June’s sunny weather set the stage for a fly-casting exploration of the Stuyahok River in consideration of the proposed Pebble Mine. 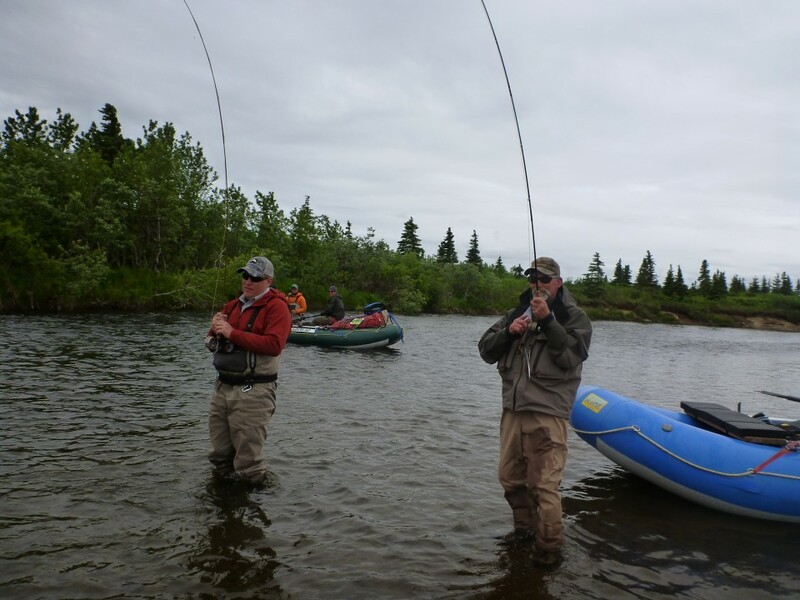 Fly casters Aaron Enz, & Ken Gangloff, teamed up with author Paul Greenberg, & sea food chef / National Geographic Fellow Barton Seaver to explore a remote river that lies in the shadow of the Pebble Mine proposal. We were inspired by the May 31, 2012 Environmental Protection Agency hearings where Dennis Andrew, the New Stuyahok Village Council chairman, testified that the Pebble project was completely “unacceptable” to the people of New Stuyahok who depend upon the robust Sockeye Salmon fishery of Bristol Bay. Our group of 6 would fly into the headwaters of the Stuyahok and learn for ourselves over a week long float what the land and waters of the country offered up, besides copper, gold and toxic mine wastes. 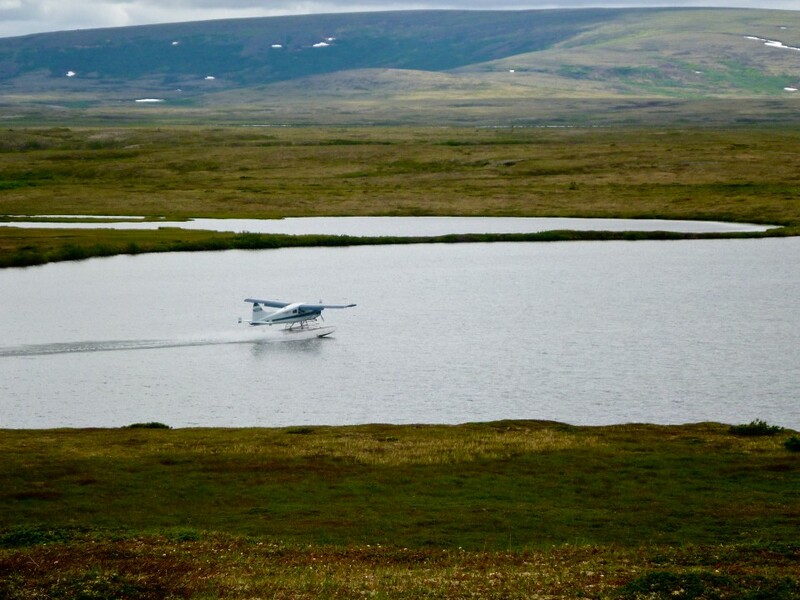 On June 26, we circled a small tundra lake, landed, and unloaded a week’s provisions. With map & compass, fly rods, and our rafts we came to explore and after exploration to tell stories of the landscape and fishery as we found it. The Stuyahok River drainage is adjacent to the mineral deposits of the proposed Pebble open pit mine. It is not precisely in the mine’s footprint but drains low mountains just to the southwest of the main Pebble mining claims. We timed the trip to intersect with the first arrival of Bristol Bay Salmon. 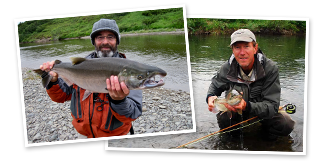 Aaron Enz and Ken Gangloff are well-travelled fly fishermen from the western United States; indeed they are bona fide world travelers. They were joined in Dillingham by two notable authors on the subject of fish from the eastern seaboard, Paul Greenberg (Four Fish) and Barton Seaver (For Cod and Country). We met in Dillingham where Oliver Merrill and I, fly fishing guides, arranged our logistics and we departed by float plane the following sunny June morning. It’s hard to overstate the enthusiasm we felt for the rolling tundra landscape while we deplaned and unloaded our week’s gear. Ptarmigan, which are grouse like birds of the arctic flushed with their oddball cackling cry, Arctic Terns plunged headfirst, and Tundra Swans patrolled a small lake as we pulled inflated rafts a few hundred yards across wet tundra to the upper Stuyahok River. Then we loaded the rafts, and strung fly rods while Arctic Grayling rose to the surface and dined on caddis flies. We knew that Barton Seaver, a renowned fish chef, had never caught a fish with a fly rod and so it was a visual feast for us as he leaned to cast and practice the elements of the sport. Over the course of the afternoon Barton, Ken, Aaron, and Paul harvested a handful of plump Grayling for the evening meal while releasing a score more. We floated slowly down river enjoying the grayling fishery while trying to take it all in, the scenery, wildlife, the proposed mine on the horizon, and the clear water. Later in the evening we made camp on an island that I refer to in my field notes as “Ken’s Camp”. Chef Barton Seaver, with one half dozen certifiably fresh, filleted, deboned, cubed, Arctic Grayling, wanted a sauce to compliment the fish. He poked around through our kitchen where pasta water was bubbling. With mushrooms from the farmers market in Dillingham, Oregano from Jennifer Romo’s garden at Lake Aleknagik, butter from Tillamook Oregon, and a handful of pine nuts from Trader Joes, he sautéed the fish and mixed the sauce, added it to the pasta, then cooked sauce and pasta together for two or three minutes. It was rustic pasta fitting for our first camp in the upper Stuyahok. June 27, 2012. Day two. Our mission: To hike north toward the proposed mining development and see for ourselves what lay in the shadow of the proposed mine. From riverside we scrambled up a gravel bluff and took a bearing north on a distant hill top, elevation 800 feet, shown on the map with a commanding view of the mountainous lands toward the Pebble. Off we went over dry tundra that looked remarkably like the short-grass prairie of Montana or Wyoming, whose landscapes are stained with a legacy of toxic open pit mining. Patches of dry gravel and white caribou moss made easy hiking along the rim of a gully still packed deep with unmelted snow. Brown Bear and Caribou worn trails made good footing. 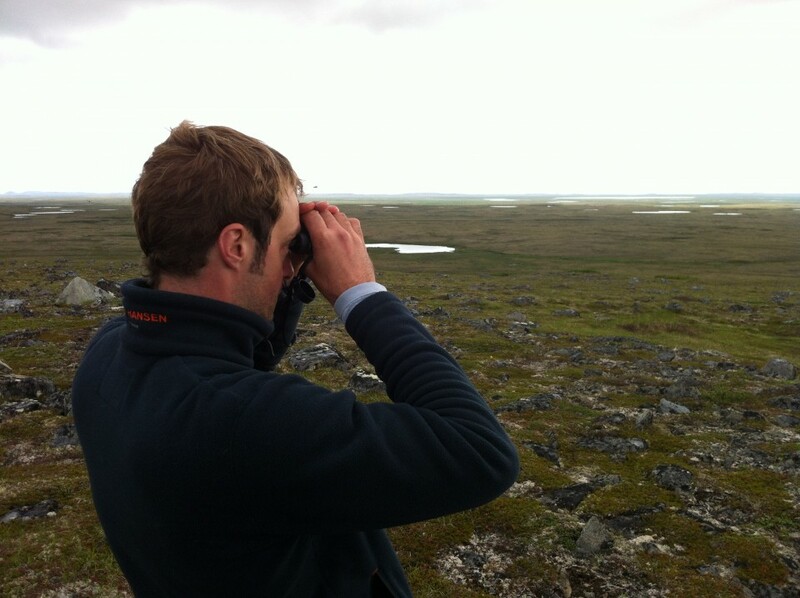 Enroute we made close range observations of a large bodied shorebird called the “Whimbrel”, which is a type of Curlew having a long, down-curled bill. In fact we passed through the territories of 2 breeding pairs of Whimbrel spaced about one half mile apart. The vantage from the chosen hill top included an unusual visual quality created by the randomly shattered rock, some like tipped over grave stones, dispersed on the crest. The hill must have been the ancient bedrock summit of something much larger in the past. Photos and video clips of our group at this overlook show the shattered rock but also a human dimension. The internal landscape of the participants shows through. That fine sunny vantage should bring feelings uplifted by the scenery and the vaulted sky. But look candidly at the group gathered on the hilltop and see a group deposed as if at a funeral. 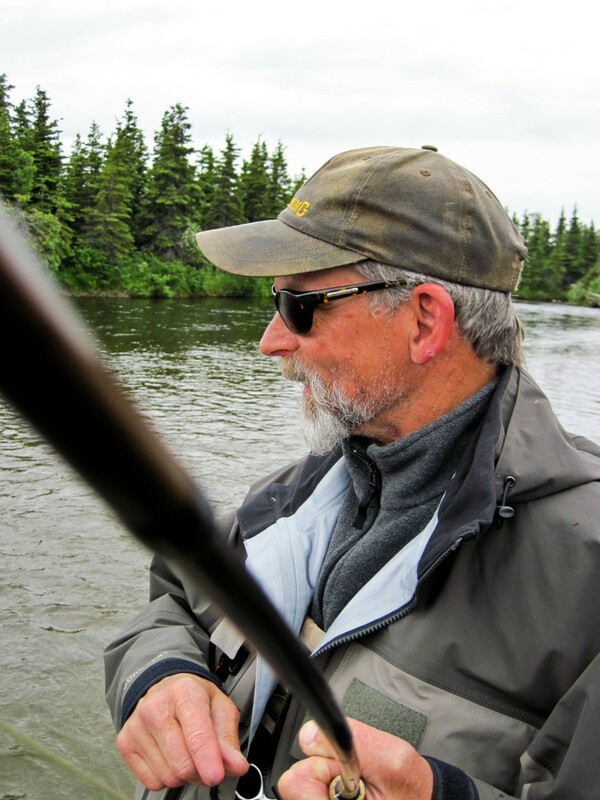 As a trip leader who brings guests from around the world to fly fish in the Bristol Bay I am acquainted with an anglers range of emotions, their personal internal landscape, ranging from the “great pleasure” of at the trip of a lifetime, through “irksome moods” brought on by mosquitoes to a “vast melancholy” from the loss of a truly grand fish specimen. 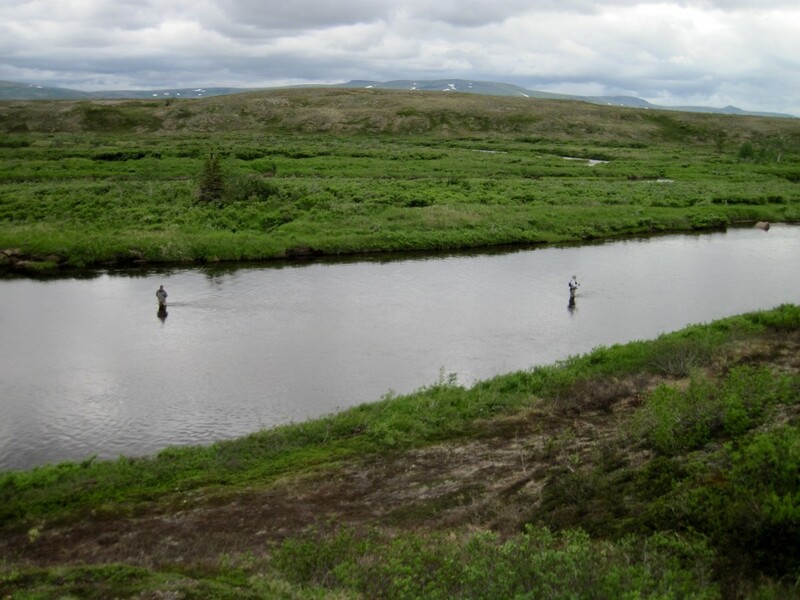 That type of emotional spectrum is consistent with travel across the Bristol Bay landscape and the sport of fly-fishing. 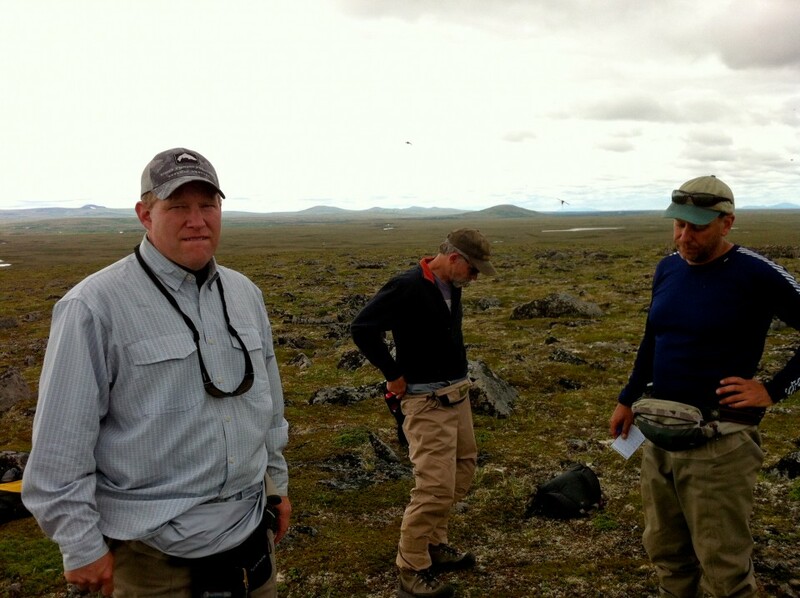 But here on this lovely hill, “in the shadow of the proposed Pebble mine”, were men with downturned looks and grimaces as if dining on something quite bitter. We were looking across a land that in another context would be beguiling. We discussed what we saw and why we felt it was important for us to be there as witnesses and to be a voice for the resource. Still it felt like a burden was laid on the group just by seeing the land of the proposed Pebble. The following day we loaded the rafts and went in search of, whatever it was that defined the Stuyahok and whatever else fell within the shadow of the Pebble. Would it be Sockeye Salmon? Would we find mammals, large like bears or smaller like foxes? Would we find navigational challenges like log jams? What we discovered that day were Rainbow Trout scattered here and there amid the Grayling bounty. They were ordinary sized trout but they were wild and pigmented with leopard spots and they were in their home waters, the Stuyahok. On day four, we passed below 500’ in elevation and the landscape along the river changed from tundra to boreal forest, as we descended through the tree line and spruce trees appeared. We beached the rafts and climbed partway up the flank of the 900’ elevation hill that dominates the terrain on the south bank and saw that the river bottom spread out in a wetland dominated by beaver ponds and green willow thickets with stands of dark spruce. If I were a Stuyahok moose this wetland is where I would call home. From our vantage point above the river valley we had our last best look at the Pebble terrain looking northeast. The river was carrying us westward toward the confluence of the Mulchatna River where the historic village of Stuyahok once stood. 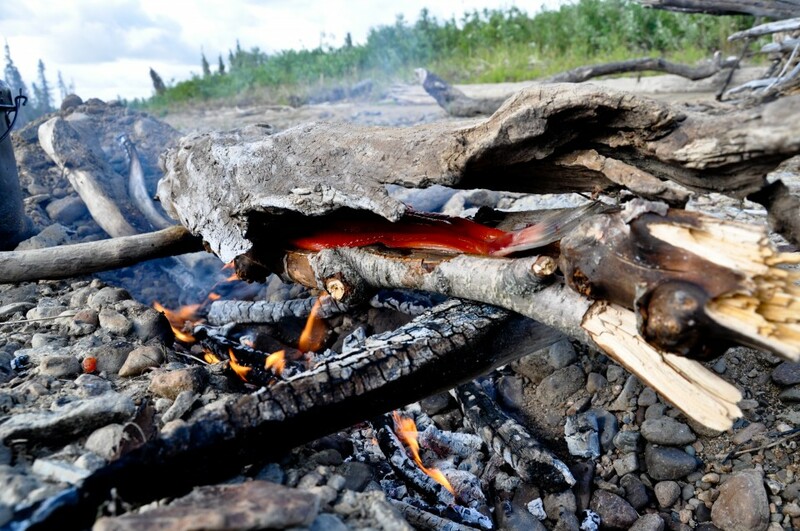 It is not a coincidence that sites of contemporary and historic Alaska native villages are located at the confluence of a river with a substantial fishery. We wondered if the salmon runs had entered the Stuyahok. No sign of salmon yet. And then it happened: the first salmon of the season attacked Ken Gangloff’s fly as he swung it down and across the current. Ken had fished 28 miles of the upper river and had caught and released his share of Grayling and trout but he was also searching for Salmon, the lifeblood of these rivers. King, Chum, Sockeye, Coho, and Pink Salmon return each year. Which species would be the first? 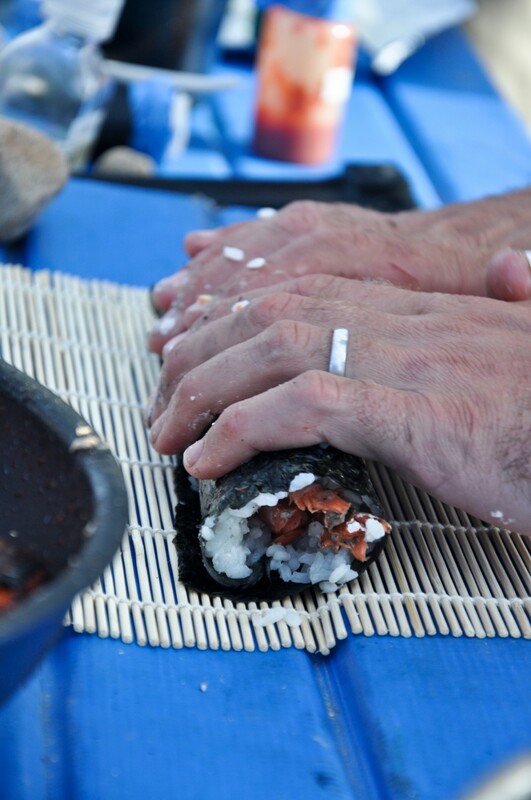 Ken’s fish was very strong so there were two initial possibilities. We first considered the fish likely to be a King as it surged across the pool into the main current. The King Salmon return early and fight hard but later when we caught sight of the fish it showed a calico pattern of rouge, black, and green, a Chum Salmon for sure. Ken released it and so marked the beginning of the annual salmon cycle for the Stuyahok and for our party of anglers. The second Salmon of our season was the salmon of Paul Greenberg’s dreams. 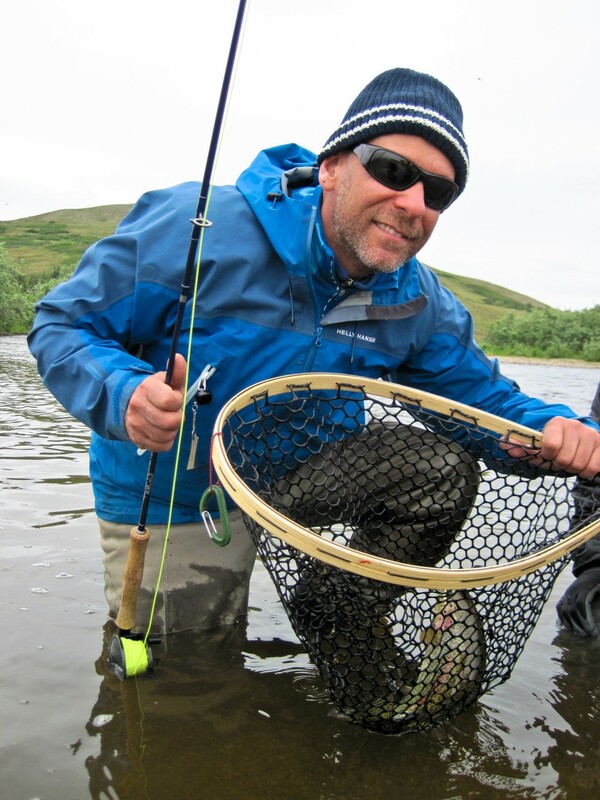 It was the Sockeye Salmon that Paul had dreamed of catching fairly on a fly rod for several years. It was the Sockeye that for us symbolized the reason for the Stuyahok trip. 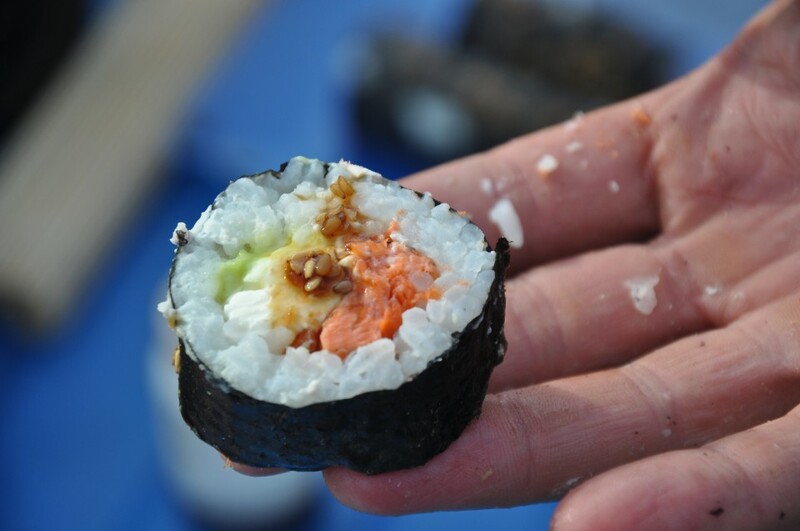 It was the salmon at the center of the Pebble debate, the salmon that is favored by chefs worldwide. Paul cast and the salmon moved to his fly, took it aggressively, and the rest of us pulled over to cheer. 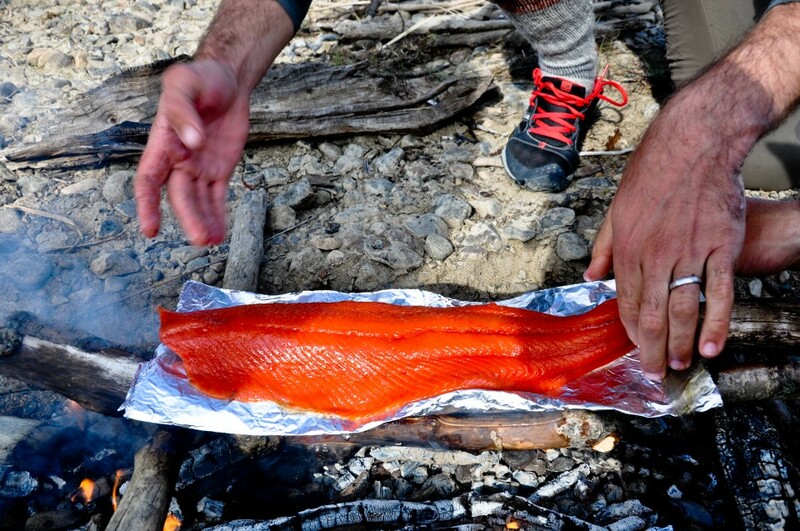 Later that evening Barton Seaver created one of the most memorable salmon dinners of our lives. “The big payoff for the grizzlies is the salmon, which anyone who watches nature programming knows is the ultimate high-energy blast and an invitation for a mid-stream fishing trip. It was therefore fitting that as the tundra shifted into boreal forest and the signs of grizzly got more apparent we caught our first salmon, a 15-pound male “chum salmon” with great gaping teeth, grown specifically for its upcoming mating ritual, and brilliant tiger stripes. This salmon we released, figuring it was something of an alpha male, among the first to make it up the river in the summer of 2012. And then, curiously, we found ourselves in the position of the grizzly — desperately hungry with no protein to eat. The “bite” turned off in the afternoon and nary a fish could be caught for dinner. 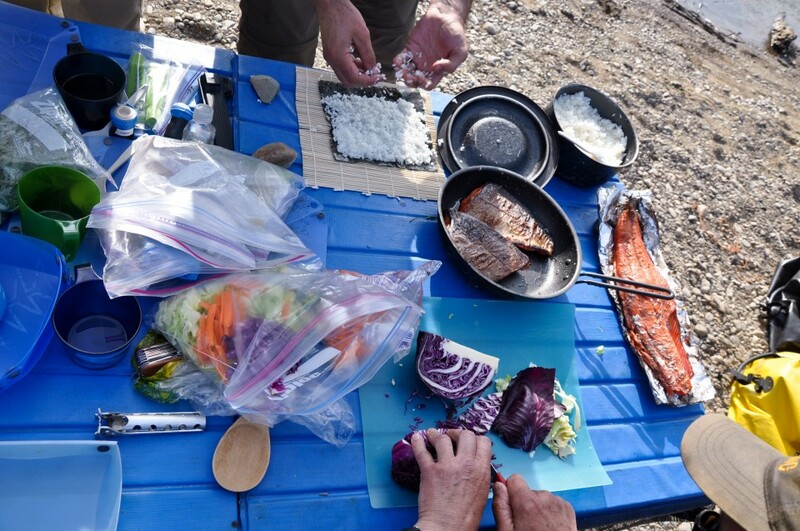 Then, like bears, we rummaged in the forest for Fireweed for a salad and fell back on the camp supplies, which on day five are getting a bit sparse. We joke with Mark that he is like Shackleton, meting out the supplies as the expedition continues. We passed into the salmon rich the lower Stuyahok on day 6, the day the Sockeye was caught. It marked a turning point geographically and philosophically. The river exited the hills and ahead of us was infinity of broad flatness toward the confluence with the Mulchatna and eventually the Nushagak. 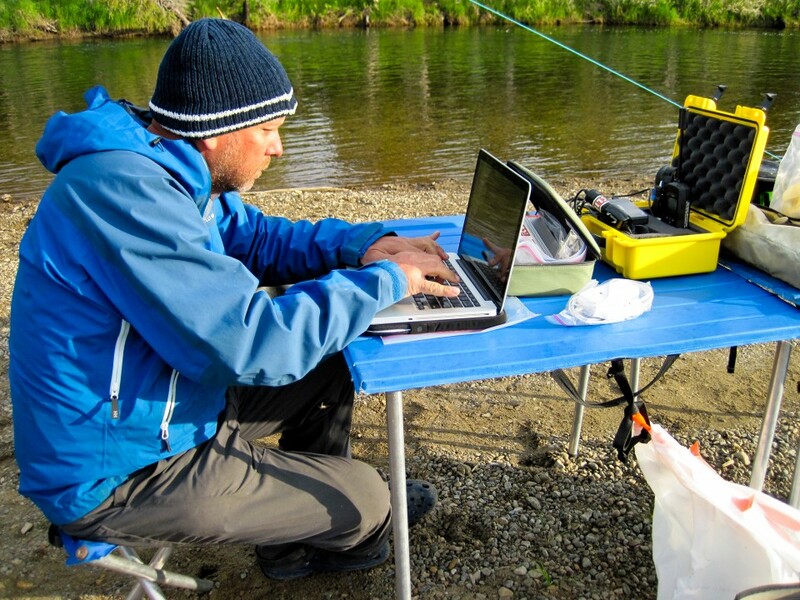 The salmon rich lower river was philosophically significant because now our group refocused from resident fish species to the resource most in vital to the Bristol Bay, the sustainable migratory salmon fishery. Dinner conversation in the now salmon rich river swirled and focused from fishery to fishery and species to species around the world. From Striped Bass, to Cod, to Yellow Fin Tuna and a dozen species I’d never heard of. The conversations in the lower river eddied around places where aquaculture and commercial fishing are succeeding in spectacular ways to where fisheries are failing with grave ecological consequences. 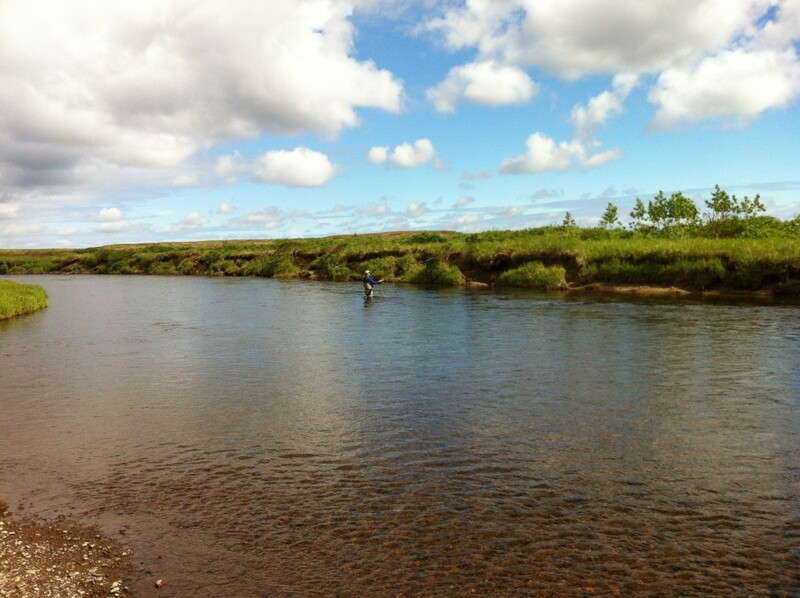 We passed through the lower river to the confluence of the Stuyahok with the Mulchatna. The final hours rafting and casting were quite focused. Our time ran out for fishing and in the last reaches we passed by a great school of fish staged in the pool at the confluence. There is finality on a rafting trip that cannot be overcome. When the raft reaches the end of the river there is no going back. 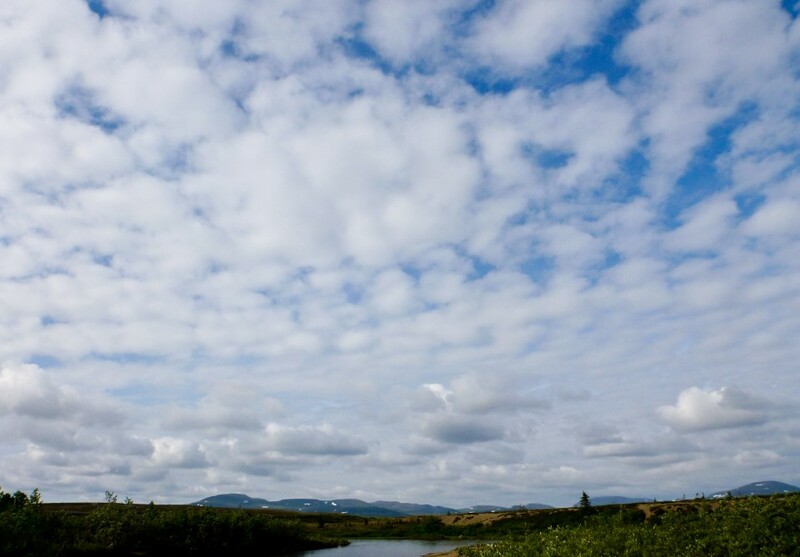 We hope that the State of Alaska, who are stewards of the Bristol Bay salmon, realize that if an open pit mine is permitted at the headwaters of the worlds greatest fishery, that there is no going back.